A "gunsmith" in the Saphan Lek market works on a pistol. The gun is a sophisticated replica of a semi-automatic pistol. It fires BBs. Bangkok city officials are closing another landmark. The markets at Saphan Lek and Saphan Han, across the street from each other at the end of Yaowarat Road were supposed to be closed by Monday Oct. 12. Saphan Lek is/was famous for toys, replica guns (real guns are tightly regulated in Thailand), software/DVDs/CDs and electronics. 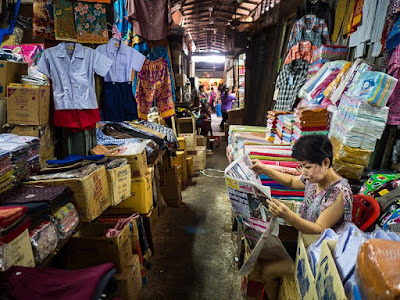 Saphan Han is mostly food stalls and cloth and clothing shops. Saphan Lek is on the north side of Yaowarat Road, at the edge of Chinatown, Saphan Han is on the south side of Yaowarat. Both markets are built on top of Khlong Ong Ang. Years and years ago people built temporary decking over the khlong (canal) and opened market stalls on the decking. 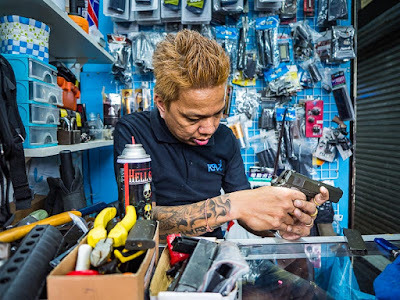 Time went on, the decking and the shops become more elaborate and now Saphan Lek is a warren of small shops, completely enclosed and air conditioned. Saphan Han is more rustic and old school. Toy car vendors put together some of the merchandise in their shop. The markets' location over the khlong is their undoing. Water management and flood mitigation is a huge issue in Bangkok. City authorities say the temporary decking and piles sunk to support the decking are clogging up the khlong and complicating flood control efforts. 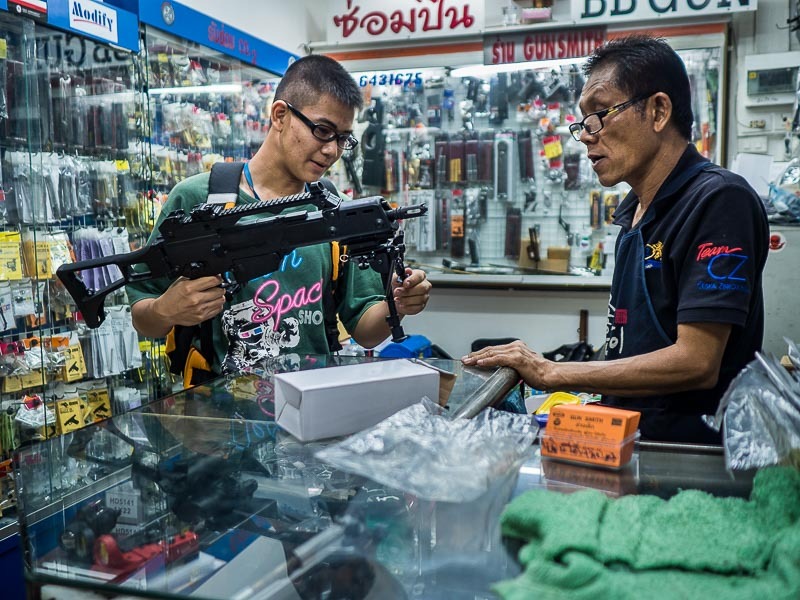 A teenager buys a replica BB gun in Saphan Lek. While a cloth and clothing vendor reads a newspaper in Saphan Han. The vendors say their stalls don't interfere with flow of the khlong and that the city wants to remove them so the land can be redeveloped. The city gave the vendors very short notice to vacate. They delivered letters on September 28 giving the vendors until October 12 to get out. The vendors aren't going without a fight. They've taken their cause to Thailand's human rights officials, who haven't ruled yet. The city said the October 12 deadline was solid. I talked to a couple of vendors early Sunday who said they probably would have to close. Eventually. But, they said, "arrangements" would be made in the short term to allow them to stay open for a few months more. 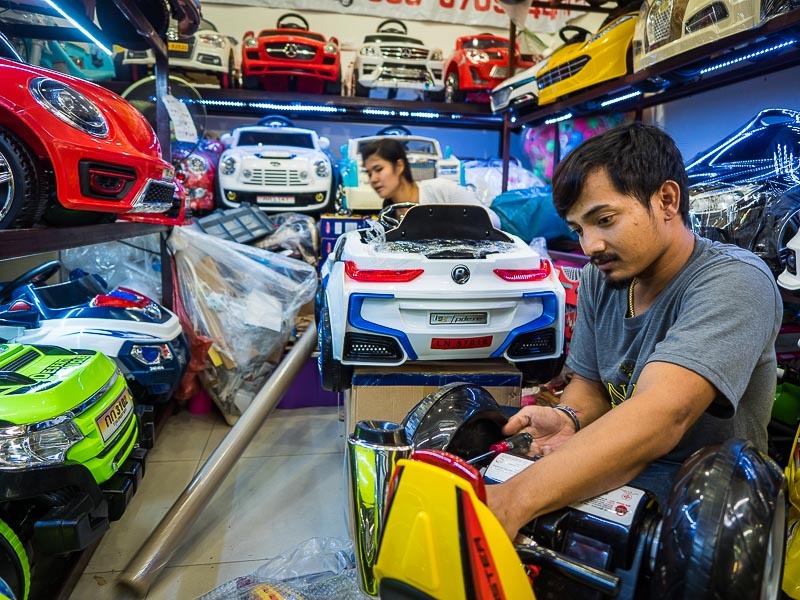 Shoppers walk through small shops selling toys in Saphan Lek. I don't know who's right and who's wrong in this one. And I don't know what's going to happen. I've gone to Saphan Lek/Saphan Han a couple of times in the last month and it doesn't look to me like anyone is making plans to leave. Sunday afternoon, many shops were unpacking more merchandise and putting it on display. There were no "going out of business sales." Although there were a couple of shops closing down, in general, it didn't feel like a place on the verge of shutting down. A man looks at what used to be his coffee stand in Saphan Han. He was one of the few vendors actually shutting down his shop. 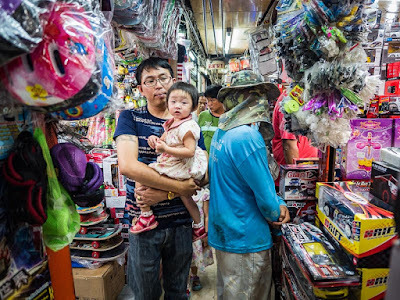 Closing Saphan Lek and Saphan Han feels like it's a part of a much bigger trend in Bangkok. Namely shutting down and evicting local markets, that serve primarily the poor. In the last few months, city officials have closed street markets around Tha Chang and Thammasat University (on the river in "old" Bangkok). Bang Chak market, a few kilometers from our apartment on the BTS line, far away from the river, is being closed. The people around Wat Kanalaya are being evicted. There are plans to evict other poor riverside communities and redevelop the land into high end housing and retail. As far as I know, this is not a grand conspiracy. I think it's more a series of coincidences. Still, it's changing the face of the city in a way that's not necessarily better. The are more photos of Saphan Lek in my archive or available from ZUMA Press.